Walk Off: How Many Steps Did Our Editors Take During NYFW? Oh, New York Fashion Week. Just last week you made us want to kick off our heels and run home to our beds to sleep for, well, about a year (if we had it our way). Between trekking from shows to presentations to parties, we admit it's a draining time of year. Don't get us wrong — we love the clothes, designers, and street-style frenzy, but we think Fashion Month is comparable to a fashion olympics, sans the medals. By now, our readers know how much work it takes to cover NYFW, but just how much ground do we cover in that one-week span? To find out, we enlisted the help of Nike, who equipped our super-fit team of editors (and one photographer!) with FuelBands to clock exactly how many steps they took throughout the week. The FuelBands tracked our steps and awarded us "fuel points," which is a number that doesn't take in a person's physical makeup, as a calorie count would, but, instead, awards participates points purely based on how active they are. So, in order to find out who the winner was (because, let's be honest, that's what we all want to know, right? ), we tracked our individual steps and our fuel. Click through to see who won! As a group we clocked in over 430,952 steps and gained 144,829 fuel points, which means someone should totally buy us a round of milk shakes. "Slower day. Stuck inside editing and shuttling between meetings. One long walk to a midtown lunch (in flats, mind you) got me to my goal." "Too many shows and presentations to count. Creatures of the Wind was a highlight, though, along with two new blisters on my right heel (thanks pointy pumps) and our snow-storm Fashion Week party with Suno. No problem hitting my goal…I think I ate three lunches today." "Less shows, more editing and paperwork today. Sneaking my L.L.Bean boots in a tote likely helped burn a few extra Fuel points." My sister's birthday, slick roads, and a late car service offered a slow start to the day. It picked up later on with an impromptu Chelsea shopping spree with creative director Piera Gelardi and a conference call back at the office at day's end. Can thank Rachel Comey winter white oxfords for preventing any post-snow-storm wipeouts." Steps: 11, 245. Fuel: 3,100. Crazy day…like the busiest Fashion Week day on top of the busiest normal day. The Ruth Reichl feature in The Daily though was the best between-show reading ever!" "What did I even do last Tuesday? It was only a week ago but I have no idea. What I do remember clearly: Adam Lippes brand-new collection and re-entry to Fashion Week. A highlight to be sure, and a hike all the way up at Columbus Circle." Steps: 11, 013. Fuel: 3,100. "My official last day of NYFW, but there's no rest for the weary. Thanks to our social media editor, Lexi, I made time to acquire this snazzy coat from Zara…my new winter-to-spring go-to. Thanks, Lexi!" 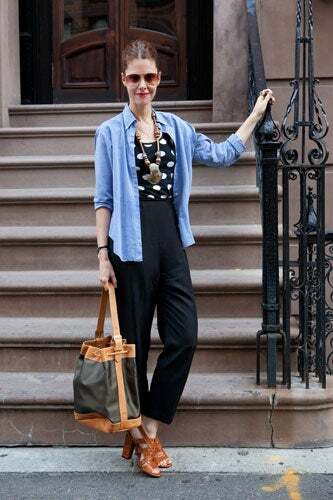 "I'm on a plane to go power thrifting with my friend Pamela Johnston of Plume Jewels in Palm Springs…my husband is coming along for some R+R and hiking in Joshua Tree. A nice finish to a marvelously nutty week." "Major heels day. After three back-to-back morning shows all over town, I finally got my fuel band — yes, I said after. Kind of a bummer not to have gotten the credit for the majority of the day's activities but I made up for it later that night on the dance floor (and, okay, maybe by giving my fuel band to our office dog and letting her run around a little). Nothing like looking down during a good dance jam and seeing your 'G-O-A-L meter going wild.'" "Today was an active day with double the cals and steps from yesterday. I would venture to bet that the majority of these steps came from dancing at our Suno after-party (in high Chrissie Morris heels, mind you). No, I didn't walk home over the Brooklyn Bridge, ahem. But the dancing was definitely my major source of cardio for the day." "Prabal Gurung, Alexander Wang, Tibi — Saturday's shows were just as major as my steppage. Admittedly though, I cut home early from the after-parties due to sore feet (yes, heels again)." "I honestly cannot believe how low everything was today. Between a morning in the office, three midday shows, lunch with a friend, two street-style video shoots, and back to the office before heading home for the night, I was sure the day was going to be mine. Unfortunately, the cold weather definitely played into my decision to take cabs and subways everywhere. I know, excuses, excuses." "Today, Piera convinced me to walk around in between shows, causing me to miss my sunnies at Karen Walker but also aiding in my 13,771 steps. Given my activity, I'm surprised the calories are so low, but it's more about the experience anyway, right? Hot tip: If you're attending multiple shows with Piera, bring a change of shoes. Again, it's the heels that got to me." "What really bumped me up today was walking from The Standard to dinner. However, I think I could have done a bit better in the step department. Either my strides should be shorter or my walks should be longer. I'm a bit confused about the calories; I feel like I worked harder on the 10th and 11th but burned more today — not complaining though." "I'm not saying I'm proud, but after a cluster of morning shows, a day in the office, and a few skipped events, I am happy to say I still reached my goal (somehow) and in the most painful heels of all of Fashion Week — they were about a size and a half too small — really stepped out with a bang." "Okay, okay, too much chocolate, no fashion shows, and too little walking. But this is the day of L-O-V-E, and today, I really LOVED being lazy...to the point of nearly sedentary." TOTAL: Steps: 81,446. Fuel: 29,139. "Okay, to be fair, I didn't turn this sucker on until at least 1 or 2 p.m. But I attended a show and I hit my goal at 10:45 p.m., which makes sense, because I took this Thursday to check out the VFiles party and the Band Of Outsiders party. Going to be honest with this: I was mostly walking around parties. Sorry, guys, but that's the glamorous life I lead." "Do we get to multiply if I was wearing insanely painful, totally inappropriate heels? Because I was. And on top of that, as you might recall, it was blizzarding. This was the night of our Refinery29 party, but I also attended Cushnie, Helmut, and Charlotte (which you can see because I was traipsing around mostly in the afternoon. But because the weather was turning into a snowmageddon, I cabbed it more than I normally would. Well, that, and my feet were committing seppuku on my watch." "Yeah, I barely passed the 2K threshold mark, because I was trapped at home for half of the day due to the blanket of frozen water that was laid before myself and the events of Fashion Week. I got a nice boost by trudging (literally, TRUDGING) through the snow around 1 a.m., but then I didn't start my day around until 6 p.m.. I stayed mostly at Milk and The Standard, and then I cabbed it home. Weak, I know, but hey, it was a blizzard." "I went to a few shows earlier in the day, but as a news editor, I had to be primed and ready in front of my TV for the Grammys that Sunday night. And as much as the Grammys make me want to jump up and down in excitement/rage, I don't think jumping and/or pacing counts for the Fuel Band." "I sure did feel like I walked a whole lot more on Monday than this, because I went uptown/downtown, like, eight times. I was in the office, but then I accompanied the crew to Karen Walker (we all love to go), and then I went uptown for Betsey and downtown for Wes Gordon and then straight home to bed for lots of napping." "Another day I feel like I did WAY more walking than the Fuel Band shows, because I was at the tents filming Rudy Cam, which had me kind of running around in place. Because I was out of the office all day, I skipped most shows, except for The Blonds because it is always a good time." "This is, my friends, what is called Fashion Week Fatigue. I was exhausted, my feet battered and bruised, and my attention span waning — even though I still had a heap of shows to go to. So, I sucked it up and cabbed lots of places, because I literally felt like a husk of a human being." "No Fuel Band today! I gave myself Valentine's Day off." TOTAL: Steps: 38,256. Fuel: 19,353. 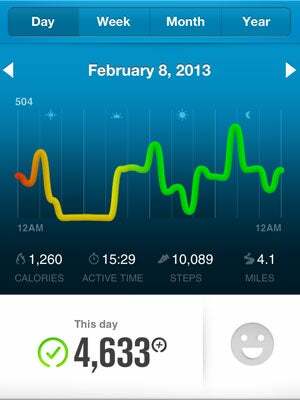 "My first day with the Fuel Band! I only had my new accessory for half a day but, luckily, I had quite an eventful evening that took me from our offices in the East Village to dinner on the Lower East Side for my best friend's birthday to the Band of Outsiders party on the Upper East before I headed back down to Chinatown for a little late-night karaoke." "Shows on shows on shows in the snow, might I add, meant I smartly wore my new Nike Wedge Dunks. I was definitely running around, quite literally, from 8 a.m. 'til way late (see below!)." "So, not only were the 8th and the 9th probably my busiest two days in terms of shows, but Friday was also the night that we co-hosted Suno's after-party at the Jane Hotel. It might have began on the 8th but it definitely led into the 9th and by the time Piera (R29's creative director) and I were ready to head back to BK, New York was in the midst of a full-blown blizzard. Needless to say, we struggled finding a cab and, while we looked, we decided that it would be awfully fun to just walk the bridge. Yep, we walked all the way back to Brooklyn, and it was by far the highlight of my Fashion Week, as well as my highest steps/fuel count, given that the Fuel Band resets at midnight." "The Fashion Week flu hit me early this year. I had been battling a cold since going to Denmark for Copenhagen Fashion Week, and it came back with a vengeance on Sunday. Luckily, I only had a few shows on my schedule and I could send people in my place to all but one of them. Other than the one show I made it to, I was very horizontal all day long, and my fuel band will back me up on that one." "Back up and running! It's Monday morning, and I am beyond thankful that I got some rest yesterday because I hit the ground running, and in some serious four-plus-inch heels, which is very rare for a sneaker girl like me and definitely meant a few more cabs here and there. Long story short, it was a lengthy day but without the fuel points to show for it. Bummer!" "Still in heels but all my shows were conveniently on the westside, which meant I didn't spend anytime at the office but clocked some serious hours at my home away from home, Milk Studios (thank God for Duane Reade's yogurt pretzels and our R29 photo booth that really saved me from any awkward half-an-hour boredom). I did a ton of walking up and down 10th Avenue, heels and all." "Things are starting to wind down and, by this point, I really needed to spend some solid hours in the office sifting through the backlog of things that had taken a backseat to Fashion Week. I ran out for a few shows here and there but spent most of the day at my desk catching up on emails and with our local editors." "And that's a wrap! I only had one thing to attend on the last day of NYFW, so I hunkered down at the office for most of the day (in an outfit as close to pajamas as possible) and then skipped my way to dinner before calling it a night early." Steps: 8,715. Fuel: 3, 195. "First day! Spent lots of time walking laps around the office!" Steps: 2,088. Fuel: 1, 593. "I was feeling somewhat under the weather, so didn't move around very much." "I forgot to put it on after the I got out of the shower!" "I had to go to D.C. for a family funeral." 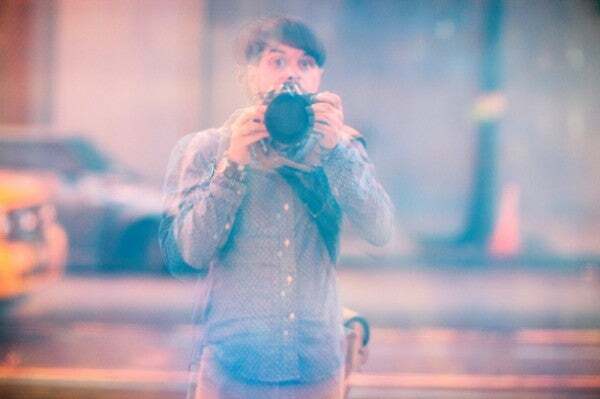 "I was fogged in at the D.C. airport. When I finally found a cab, I made it over to the train station in order to take the Acela back up to New York." Steps: 7,718 steps. Fuel: 2, 568. "I'm trying to make up for lost time! I'm pretty sure I danced up a storm a little too late in order to do so. " Steps: 11,664 steps. Fuel: 3, 678. "I did Barry's Bootcamp class at 9 p.m. today." Steps: 7,617. Fuel: 3, 356. "I walked from my apartment all the way to the Ralph Lauren show!" TOTAL: 45,747. Steps: Fuel: 18,233. "I only had the fuel band about half the day due to a sizing incident, but Willow unwittingly helped me to my goal." "Pretty hectic day today! Lots of running around, uptown, downtown, uptown, downtown. Unfortunately for my Fuel, I’m taking the train and cabs as it’s snowing and raining, thanks to Mother Nature. Biggest shows for street style today are Kate Spade, Jason Wu, Yigal Azrouël, Rebecca Minkoff, and rag and bone." "Today the competition is up, as I’ve heard rumors of an unnamed competitor attaching a fuel band to an office pup! Fuel by any means necessary. This included dancing around while processing files and power walking home to Greenpoint. I also put my fuel band on my right wrist while retouching. It worked. I figure it’s not cheating if you’re using energy. Mostly offsite shows today, so lots of trudging through the snow and slush. I’m also beginning to benefit from staying up really late editing." "Kind of a slow day today, travel-wise. Thank God. I’m exhausted. Went to Derek Lam, DKNY, Thakoon, and DVF. Fashion Week starts to become a blur by the fifth day. The weather is a bit nicer today but still pretty cold. Really great shooting day though. Got some great pictures of Hanne Gaby Odiele while waiting for a cab and had a chance to walk down the snowy highline. Walked home from the train for an extra 400 or so fuel points. Lots of editing to do tonight!" "The weather is pretty dreary today, but fashion-wise, no one seems to mind! Lots of offsite shows means lots of fuel! Tons of walking today. Highlight of the day is definitely shooting the Men’s editors walking though a steam pipe outside of Mark McNairy. Continued my strategy of dancing around while processing to gain extra fuel and stay wake after a 14-hour day." "Super-slow day today, schedule-wise, but have to keep my fuel up! Spotted an extremely rare Chanel hula-hoop bag up at Lincoln Center. Unfortunately, in a half asleep stupor that my mornings have become, I sent the wrong files and had to run home (to GREENPOINT!) from Lincoln Center, then back to Rodarte on 22nd and 11th avenue! Talk about fuel. The day ended with my usual five-hour session of processing and retouching files. Best part of the day was definitely spotting Rudy doing a little shoe stalking. Good thing he doesn’t have a Fuel Band, otherwise we’d already know who won. That pup gets around." "Last (major) day of FW! Besides being over-tired, sick, and hungry, I’m still alive. Not a crazy schedule today, but the weather is pretty good for shooting. Got some sun going and some good shows at Lincoln Center, which works for me. Not too much running around today and even had time to get some lunch (oysters and French union soup)! The Fuel Band has kind of grown on me and, in the future, will lead to some healthy competition, as my girlfriend has one, too. I always thought it was a pain living in Greenpoint, but the extra 400 or so points a day has really added up. Nothing beats processing and dancing though. Passed out early. Highlight of the day was definitely Karlie Kloss handing me a much-needed Momofuku Kookie!" "Last day and a short one! Only going to Ralph Lauren today. Calvin Klein is in midtown and terrible for street style. Made it through another one. I’m pretty sure this was my 9th NYFW. What a circus. 12,000 shutter clicks and 29,263 fuel points later, NYFW is over. See you in September." TOTAL: Steps:103,906. Fuel: 29,263. CONGRATS, MARK!